I have an impression that some phonophiles feel the same way about tonearms: They want them to pivot and to move up and down without undue friction, and they don’t want them to rattle during use, howsoever slightly. But while most audiophiles acknowledge that phono cartridges all have a sound of their own, and almost as many folks regard turntables in the same way, it seems that lots of audiophiles can’t accept that that 9″-plus lever connecting one to the other has a significant influence on the sound of a record-playing system. But it does, and technical explanations abound. For one thing, in order to prevent any number of audible problems, the tonearm’s effective mass must be suited to the cartridge’s compliance—not a small matter, since both of those specs can vary considerably. Other concerns are more esoteric yet no less real: If one or more parts of the tonearm are allowed to resonate and ring, the sound will suffer (footnote 2), with results ranging from a limiting of dynamic contrasts and musical force to an exaggeration of the sounds of record defects. (Rest assured: mated to a compatible cartridge, a well-designed, well-made tonearm can help your phono system shrug off surface noise.) If the arm and its counterweight are unstable and/or in a poor state of balance, bass response can be either exaggerated or diminished, and subtle spatial cues can be lost as the stylus leans this way and that way in the groove. If the vertical bearings aren’t angled just so with respect to the headshell, cartridge azimuth can change during play, affecting channel balance and, again, spatial performance. If the armtube is so poorly designed that it requires the addition of damping material, truth of tone and musicality—the player’s ability to convey momentum, flow, and pacing—may both suffer. And, yes, if the bearings exhibit excessive friction and restrict the cartridge’s motion in those planes where complete freedom of movement is required, dynamic compression will again arise, along with plain old gross distortion—a clearly audible coarsening of the sound on peaks. Of the turntables that I can afford to own, one of my two favorites is the vintage Thorens TD 124—indeed, at one point, I had three of them. (I sold one, and gave one other to my daughter.) As I’ve mentioned in articles past, I’m not sure I’ve ever found the perfect tonearm for that turntable. Arms I’ve tried on a TD 124 include such more or less contemporary choices as the reissued EMT 997, the Artemis (née Schröder) TA-1, the Pete Riggle Audio Woody, the Ikeda IT-407, the RS Laboratory RS-1, the Ortofon TA-210, the Abis SA-1 and Abis SA-1.2, the Graham Engineering Robin, the Audio-Creative GrooveMaster II, and the Swissonor TA10. The vintage arms I’ve tried at home include the Thorens TP 14, the Decca London, and the Grado Laboratory Series Tone Arm; the ones I’ve tried in other systems, while servicing other people’s TD 124s, include the SME 3012 and the Ortofon 309. Of the contemporary arms, the best were the EMT, the Artemis/Schröder—a real sleeper, sadly discontinued—and the two Abis arms, with the GrooveMaster II not far behind; the RS Lab was wildly dynamic but too clunky to use, the Swissonor appealing but in need of refinement. Of the vintage arms, the Ortofon was the best, the SME a close second—a pity I can’t afford either. The others weren’t competitive. Now, from IT Industry of Japan—the same company that manufactures the Abis arms—comes the Sorane ZA-12 ($2500, footnote 3), the model number of which derives from its effective length of 12″ (actually 322mm, or 12.6772″). The ZA-12 resembles no other contemporary tonearm I’ve seen; if anything, it brings to mind the arms produced in the 1950s and ’60s by the now-defunct Gray Research Co., most of whose products were unapologetically big and blocky instead of lissome and lean. Viewed from above, from its bearing housing forward, the ZA-12 is a single, long, continuous rectangle of aluminum, unbroken by even a headshell: Two slots for cartridge-mount bolts are machined at an angle of precisely 16.5° to the arm’s axis, thus creating the necessary offset, and a slender finger lift is neatly fitted with a machine screw. The bearing housing is no less simple in appearance, its top cover an aluminum pillbox whose plainness is interrupted only by a dimple at dead center: a boon for such alignment protractors as the Denessen SoundTraktor and the Acoustical Systems SmarTractor. 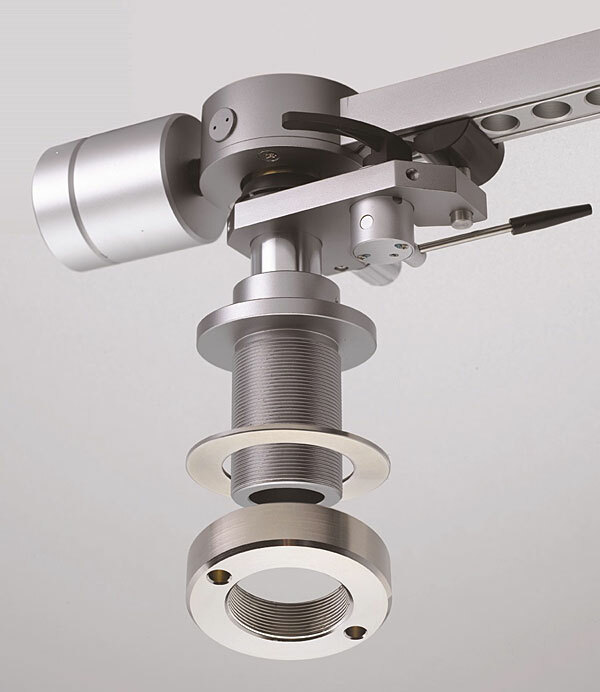 Within are what the manufacturer describes as double bearings for vertical movement: left and right angular-contact, point-in-cup bearings that are themselves free to rotate within simple sleeve bearings. Lateral movement is governed by ball-and-race bearings of the usual sort. Downforce is static, applied by positioning a pair of cylindrical counterweights on a threaded rod—to keep them from vibrating, the user tightens them in place by turning them in toward one another. Antiskating is applied by a thread-and-spring mechanism, adjusted with a calibrated knob. The overall shape of the ZA-12 was designed by Phillip Holmes of Mockingbird Distribution, the US distributor for Sorane—a brand name now used for all products formerly known as Abis. (The above-mentioned SA-1.2 remains in the line.) As Holmes told me via e-mail, “I’m far from an engineer. The people at IT in Tokyo had to fill in the pretty shape with engineering.” Indeed, viewed from below, that simple rectangle is revealed as more complex: The ZA-12 armtube—or arm beam, if you like—is machined from solid with separate channels for the left- and right-channel signal wires, and with stepped areas and recesses intended to keep the arm’s mass from being crazy-high. 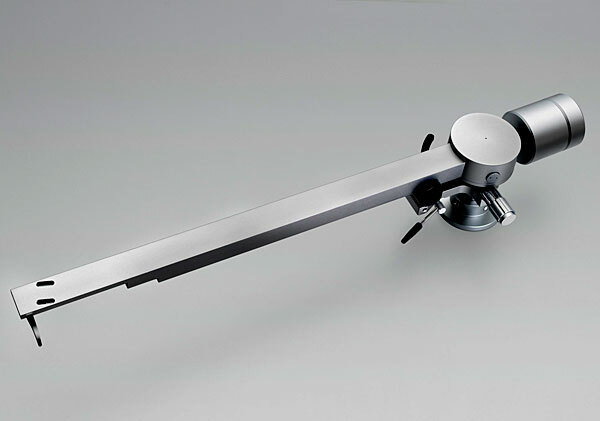 Although a precise effective mass has yet to be specified, the ZA-12’s combination of obvious bulk and greater-than-average effective length suggest that it is, indeed, a high-mass tonearm. Months ago, Holmes posted on Facebook some photos of an early ZA-12 prototype. I was far from the only one who chimed in with approval—flattering responses were seen from equipment consumers and suppliers alike, the latter group not always known for random outbursts of generosity of spirit. Sensing that the Sorane ZA-12 was more deserving than most of a thorough tryout, I wheedled and whined until a review sample arrived. Even having seen the advance photos, I was surprised at the sheer size and heft of the Sorane ZA-12. The arm measures a considerable 16.5″ from stem to stern, and while I lack an appropriate scale, there was no mistaking the ZA-12 for anything but a heavyweight. Although its apparent mechanical integrity would surely please the most discriminating of flat-earthers, this is clearly not an arm for a Linn LP12—or a Pink Triangle Anniversary, Oracle Delphi, or other spring-suspended turntable of less-than-Brobdingnagian proportions. But for my Thorens TD 124—which I run without its rubber suspension fittings, fastened tightly to a homemade plywood plinth of considerable density—the Sorane seemed ideal. I pressed into service an extra-length armboard I made from alder, fastened the DIN-to-RCA cable supplied with the ZA-12, and got down to it. Footnote 1: From an interview in Audio Amateur (defunct), quoted in Ken Kessler’s Quad: The Closest Approach (International Audio Group Ltd., Huntingdon, Cambridgeshire, UK: 2003).